Nepal: A Tourist's Manual: Coming to Nepal During Monsoon-A Good Idea? Coming to Nepal During Monsoon-A Good Idea? Formerly published at travelbuddy.com which has closed. Is coming to Nepal during monsoon season a good idea? People suggest coming to a country during the off-season. 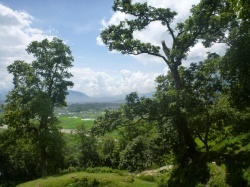 Nepal's off-season is from June to September and December to the middle of February. Can a person enjoy this country during those time periods? We know it’s going to be cold in the winter, but what about monsoon? What should a traveler know about Nepal during this time? First of all, you need to consider why you are traveling at that time. Is it to save money? Surprisingly, many Nepali merchants do not easily discount during slow times as we do in the US. Instead, it is typical to see the merchant expect you to pay more because he is not getting any sales. Western tourists are often happy to comply, which brings the prices up for everyone. Don’t let your Western guilt or ego lead you into over-spending. Along one of our local trekking trails. Always book for one day if you book online. After the first morning you can talk with the manager and get a discount if you stay longer. I don’t recommend booking online for more than a day because booking sites usually don’t allow prices under $10, which means walk in traffic might pay less. If you are afraid you’ll have to sleep on a park bench because the guest houses are all full, don’t worry. Unless you are out on the trekking trail in a very remote place you are 99% sure to find a place. Yes, the 5 star hotels book up in advance, but the normal, independent, little guesthouses are seldom full. 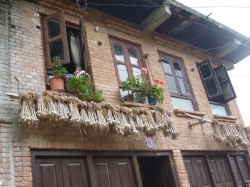 I know this because I have a guesthouse; there are way too many guesthouses in the Kathmandu Valley and Pokhara. How much does it rain during monsoon? 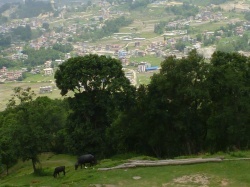 Of course it depends on where you are in Nepal; Nepal has several different climates. Here in the Kathmandu Valley it might rain for the night or morning, but it usually clears enough to do what needs to get done during the day. It seldom rains all day or all night. It’s more likely 3-4 rain showers throughout the day. If you come during monsoon, you will need to watch for slippery rocks as you walk. Many roads are paved with lovely, but slippery rocks. So, check your shoes to make sure they have enough traction. Plastic soles, as on cheap shoes tend to be quite slippery. If you intend on doing trekking in the high country I don’t suggest coming during monsoon. You could slip on a piece of ice, but the main reason is you won’t have many beautiful views. It’s often a great disappointment. However, if you would like to do volunteering, an internship or work on your thesis monsoon may not be a problem, at all. 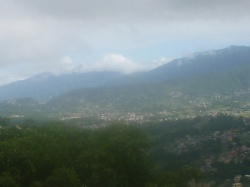 The Kathmandu Valley is mild and downpours are usually of short duration. Kathmandu being so polluted, the frequent rains keep the air quality at permissible levels. 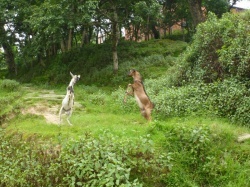 Do not plan to see Chitwan, Bardia National Park or other areas along the Indian border; it is just too hot. During the winter off season you will enjoy Lumbini and these other places, but remember it gets chilly and damp at night. You will not need malaria tablets for these places unless you go there during monsoon. Here in Changunarayan Village, at the eastern edge of the valley, we have gentle breezes and it often doesn’t rain badly enough for guests to come down from our rooftop terrace at the Star View Guest House. Unlike many places with a dependency on tourism, Nepali love to meet and get to know tourists. I am always amazed to hear a Nepali greet a tourist in their own language or invite them home for tea or a meal. If you come during either off season you will feel like a super star. Yes, there is some sense of being able to dip into a deeper pocket, but once you get out of Thamel or Kathmandu City you will find many Nepali who just genuinely want to get to know you. Come to Nepal during our lovely spring or fall tourist seasons, during the monsoon or even in the winter, but please put Nepal on your bucket list and come see this amazing country. It has something for young and old alike and more festivals than days of the year.